PROFESSIONAL. AFFORDABLE. RELIABLE. THAT’S EICH’S. We understand how to properly maintain, repair, and replace all HVAC systems. We will also take the time to educate you on your systems. Our reputation as a trustworthy heating and cooling company is our trademark. We look to build relationships with our customers. We are fully licensed and insured. You can always count on high quality, professional service when you work with Eich's Heating and Cooling. We accept Visa, MasterCard, American Express, Discover, Apple Pay and Android Pay. We offer senior discounts, free estimates, and other financing. A reliable heating and cooling system is essential to ongoing home comfort and quality of life. Proper installation, maintenance and repair will help to ensure your HVAC system performs optimally and lasts for many reliable years to come. Furnace service and air condition service is important to avoid problems that can arise from poorly maintained systems. 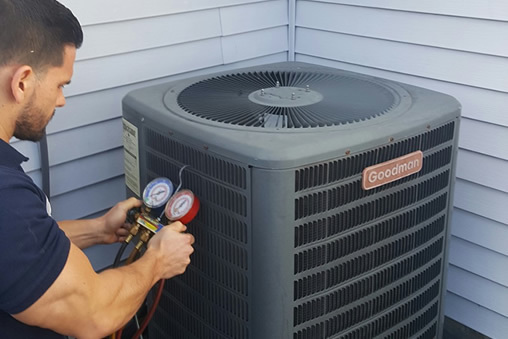 When it’s time for service, repair or replacement of your heating or cooling system, you want a proven expert you can count on for efficient, effective, quality service. We offer home air conditioning installation, heating repair, furnace installation and furnace replacement. As one of the top heating and air conditioning companies in the area, we can handle jobs big and small. We not only specialize in heater repair, furnace repair, furnace cleaning, HVAC cleaner, h eating and cooling repair services, but also hot water heater installation, humidifier installation, and air vent cleaning service. We are a family owned and operated heating and cooling company with 30+ years of experience in the industry. We are fully licensed and have a high level of expertise in all aspects of repair, maintenance and installation of a range of heating and cooling brands. We also place a premium on providing friendly, professional customer service. Don’t turn to air conditioning and heating companies that don’t put your needs and concerns first. In addition to offering a full suite of services related to the optimal performance of your heating and cooling system, we also strive to educate our customers. We’ll diagnose the issue quickly and provide you with fair, upfront pricing. We go above and beyond other heating and cooling companies. We’ll also make sure you understand the nature of the problem as well as all the actions that will be required to properly resolve it. We’ll keep you informed every step of the way, and we promise a high caliber result, every time. For quality, professional work from an experienced heating and cooling expert, you can trust our company to deliver. Give us a call and one of our highly-trained, conscientious and experienced staff members will be happy to assist you. Serving Oak Forest and the southwest suburbs including: Crestwood, Tinley Park, Orland Park, Palos Park, Alsip, Mokena, Frankfort, Lockport, Homewood, Midlothian, and Oak Lawn. Ken Eichorst, owner of eichs heating and cooling has been working with me and my family for the past 23 years. He does a great job of maintaining our air conditioners and furnaces. I've called him for emergencies at all hours of the day or night and he has always been there to take care of whatever problem we have. Can't say enough good things about Ken!!! Just a shout out to a very reputable, honest and very professional company. We have been customers of Eich's Heating and Cooling for over 20+ years. I can't say enough of their honesty and meticulous work they perform. My family and I can always count on them. I would highly recommend them to anyone needing new or repair work done. Thank you Eichs for being there when we need you. I have known Ken Eichorst and Eichs Heating and Cooling for 25 years. Ken has always shown utmost professionalism, dedication to the Trade and tireless duty to his customers; all at a very competitive price. Since hiring his company 25 years ago, I know I can always count on him for any of my heating and cooling needs and would be happy to pass his company’s name along to anyone in need of his professionalism. Ken Eichorst of Eich's Heating and Cooling is the most dependable service provider I know. I trust him completely in my home and the quality of his work is exceptional. My family and I are all clients of Eich's and we have referred many people over the years. I highly recommend using Eich's Heating and Cooling. High quality work, dependable and reliable service. Ken is someone who stands by his word and work.